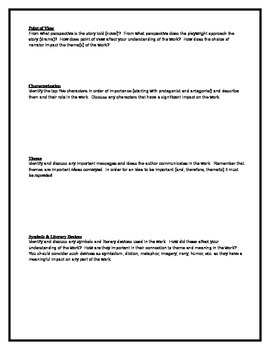 This assignment allows students to work together to come to a deeper understanding of the novel Never Let Me Go by Kazuo Ishiguro and its components. They answer a set of higher-level questions concerning such elements as theme, point of view, literary devices, etc. All of the questions are fairly open-ended, leading to great discussions, or even debates, over what the best answers are. Answers are not provided, since for most of the questions, there are a multitude of right answers. 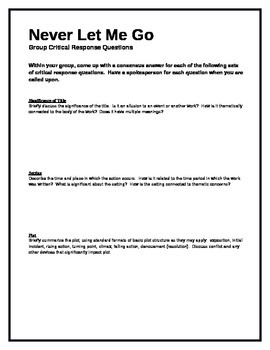 The key thing is that students support their responses with evidence from the text. This is a very helpful assignment as a summation activity at the end of the story or as a review for an exam. Works best with advanced students, but can be easily modified to work with all levels. 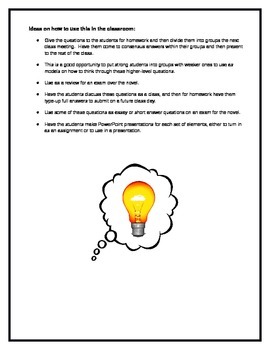 Can be used either as homework or group work within a class period (though 90 minute blocks work best).